This article first appeared on TheTrek. Occupying approximately 47,000 acres across Mount Desert Island and the Schoodic Peninsula in Maine lies Acadia National Park. Although one of the smallest national parks by size, it is also one of the most-visited, hosting more than 3.3 million tourists each year keen to explore the granite peaks, carriage roads, and hiking trails of this Atlantic coast treasure. Established in 1919 under the name Lafayette National Park (renamed Acadia in 1929), it’s the oldest national park east of the Mississippi River and the only one in New England. Acadia is a collection of preserved land from donations and acquisitions over the years, most notably from the Rockefeller family. The park has several defining features that make it special, including more than 158 miles of hiking trails that span the park and offer spectacular views of the coastline and surrounding mountains to hikers of all abilities. At the crossroads. Photo by dustin_j_williams licensed under CC BY 2.0. Although most trails in Acadia are relatively short (three to five miles on average), there are ample opportunities to combine multiple paths into a single hike thanks to the close proximity of mountains and various connection methods such as the carriage paths, and a free shuttle bus that stops at all major trailheads. 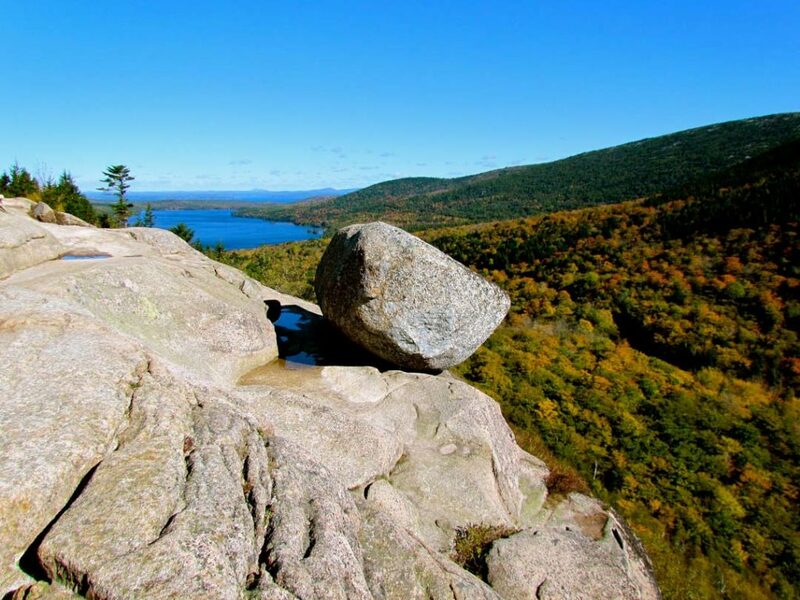 As a native to Mount Desert Island, I grew up with the park at my doorstep and have hiked nearly every available trail in all possible conditions. After completing my Appalachian Trail thru-hike this year and spending some time in Acadia before returning to work, I found myself longing for the extended-mileage days I had become accustomed to over the summer. Understanding the general layout of the park and its trails, I began plotting longer hikes by stringing together multiple summit and coastline trails. I came up with optimized routes accessible outside of the highly concentrated areas, but which cover the best views and park highlights. In doing so, I noticed there are three distinct areas of the park that have a high concentration of trails ideal for extended hikes. 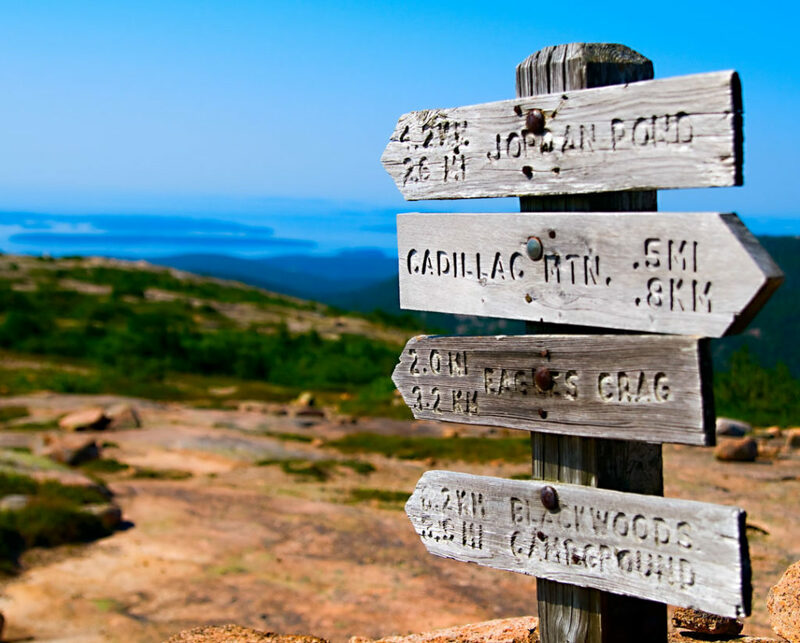 Three concentrated areas of trails within Acadia National Park. Photo via nps.gov. 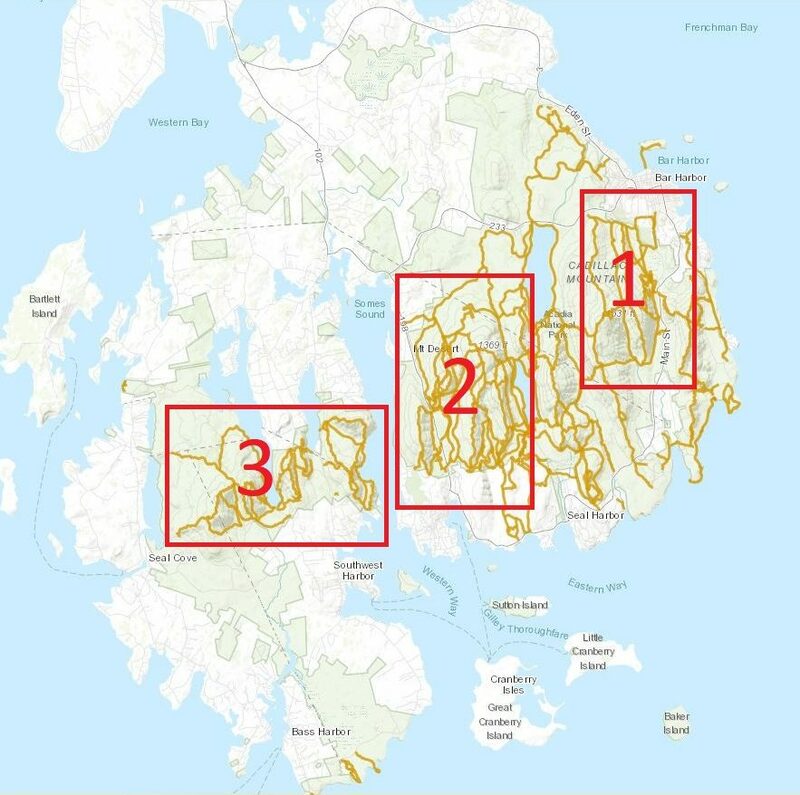 The three sectors outlined above show where the majority of trails within Acadia National Park are concentrated. Instead of highlighting a handful of outstanding trails (of which there are many), the better method is to show where trails converge, making it easier to avoid the crowds, combine multiple trails for longer adventures, and see more than the average tourist. The major source of congestion within Acadia is the Park Loop Road, a scenic, 20-mile drive through Acadia that provides access to many trails and nature highlights of the park. This route is well-known and, thus, highly utilized in the summer months. While I recommend that you take some time to pass through during your stay, the idea is to avoid the Loop Road at all costs when planning your hikes. Almost all the trails within the park are accessible from outside the Loop Road from areas which are more convenient to find parking and far less crowded. 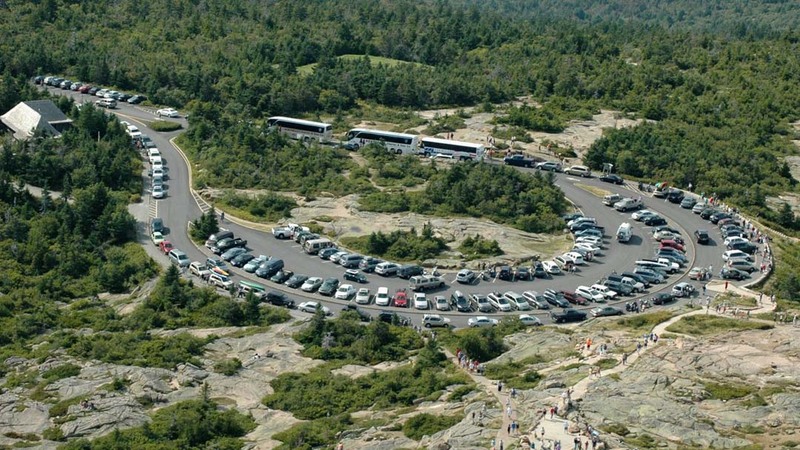 Typical congestion atop Cadillac Mountain. If you visit Acadia during the summer, it’s going to be bustling. With ever-increasing visitation numbers—predicted to soon to hit four million per year—some areas of the park are even forced to shut down during peak times because of congestion. As such, planning ahead and starting your hikes early can go a long way in ensuring you have a stress-free and enjoyable time in Acadia. From the summit of Cadillac Mountain. Photo by Angi English, licensed under CC BY 2.0. Whenever people ask where I’m from, I say Bar Harbor, even though I grew up in a neighboring village. Known the world over, Bar Harbor is synonymous with Maine tourism and as a result is one of the main attractions for visitors. 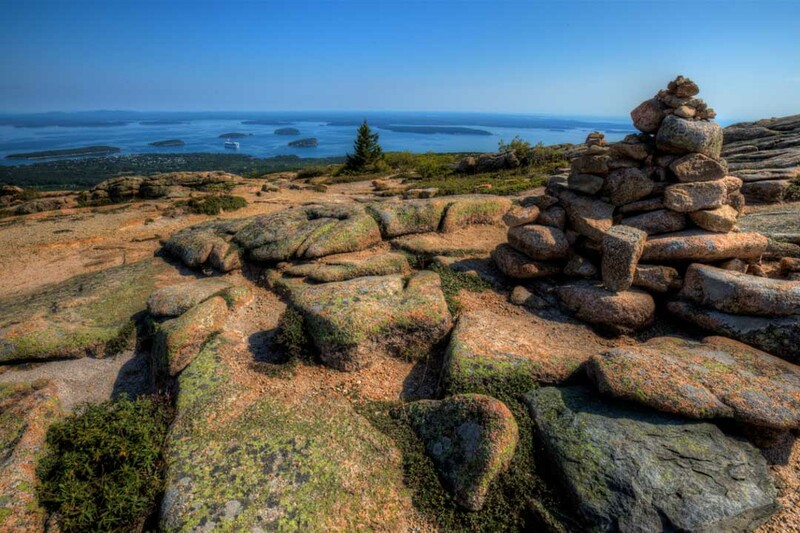 It also happens to be the center of several very popular hiking trails to summits, such as Cadillac Mountain. The difficulty of having that many trails so close to downtown is that they become completely overrun during high season, removing the serenity normally associated with walks in nature. Overlooking Sand Beach from Beehive. Photo by Jeff Gunn, licensed under CC BY 2.0. If you want to hit all these highlights in a single day, you can. Below is what a 12-mile loop hike with 3,500 feet of elevation gain looks like. It includes all the mountains and trails noted above, with the exception of the Precipice Trail (which is usually closed in the summer due to Peregrine Falcon nesting), as well as a stop at Sand Beach. Note that there are some particularly tricky sections along this route, especially along the Beehive Trail, where ladders and rungs are used to traverse some areas. If you don’t want to spend all day out there, no problem—the Beachcroft trailhead provides access to all the abovementioned trails, which can be done as shorter hikes as well. If you do plan to park at the Beachcroft trailhead, try to get there before 9 a.m. That seems to be the golden hour when tourists finally make it out for their own hikes, and with the scarcity of parking you’re in for disappointment if you arrive late. Getting there by 9 a.m. (or earlier) will give you a much better chance of finding a spot. Jordan Pond, Acadia’s deepest water body at 150 feet, was carved by a glacier. This is my favorite area of the whole park. As you can see from the map, there are many trails in this area and the route variations are practically endless. The main attraction here is Jordan Pond and the Jordan Pond House restaurant, famous for its popovers. Numerous trails converge at the restaurant and it can be a great place to start a hike or bike ride. However, as with Bar Harbor, Jordan Pond is extremely congested in the summertime and there simply isn’t enough parking or space available for all that wish to visit. Bubble Rock–precariously placed by a glacier. Photo by Jeff Gunn, licensed under CC BY 2.0. This route would bag six mountain peaks with 3,800 feet of elevation gain over 12 miles, including a stop at Jordan Pond House for tea and popovers. Again, there are so many trails here that this route could be easily lengthened or shortened as desired. 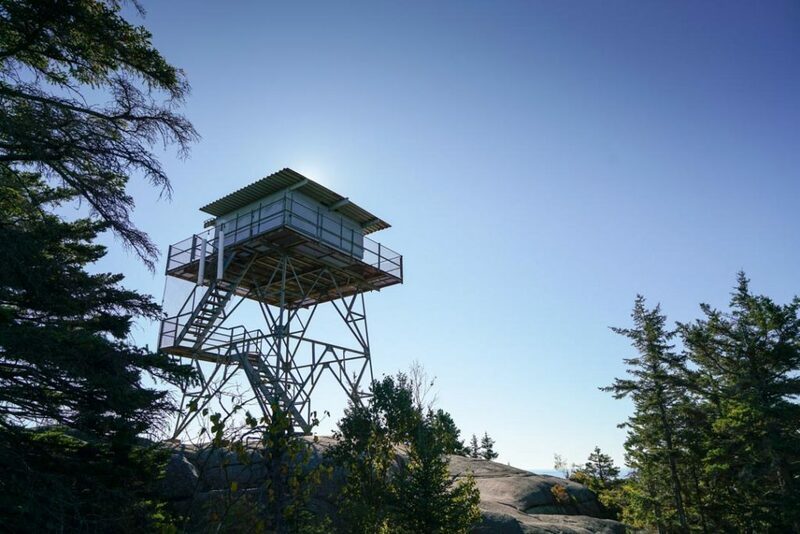 You can even hike to the Cadillac Mountain summit from here or connect to the trails from Sector 1. This area is extremely versatile, offering both rugged and rocky trails in addition to wonderfully smooth carriage roads. The area around Jordan Pond gets clogged with tourists in high season, but most of the trails outside of that immediate area are far less crowded. Mansell and Bernard Mountains. Photo by Dana Moos, licensed under CC BY 2.0. The first two sectors of hiking trails in Acadia focused on the eastern part of Mount Desert Island, home to a majority of the park’s trails and tourism. However, there are trails on the other side of the island, known by visitors as “the quietside” (or “backside” to locals). Here the trails are a bit more spread out and hidden (unless you know where to look), which means they are far less crowded. Some of my favorite views can be found on this side of the island, so if you’re looking for a peaceful hike, this is the place to go. Beech Mountain fire tower. Photo by Cody Wellons, licensed under under CC BY 2.0. Although there aren’t as many peaks to summit in this sector, you can still string together a respectably long hike without sacrificing any vistas. Here is a 12-mile loop that encompasses four of the aforementioned peaks with 3,700 feet of elevation and a stop at the Beech Mountain fire tower. With a little road walking, you could extend this hike to include Acadia Mountain, Flying Mountain, and Saint Sauveur. Once again, any of these trails can be done on their own as shorter hikes so there’s no need to fully commit to a whole-day hike if you’re not up for it. 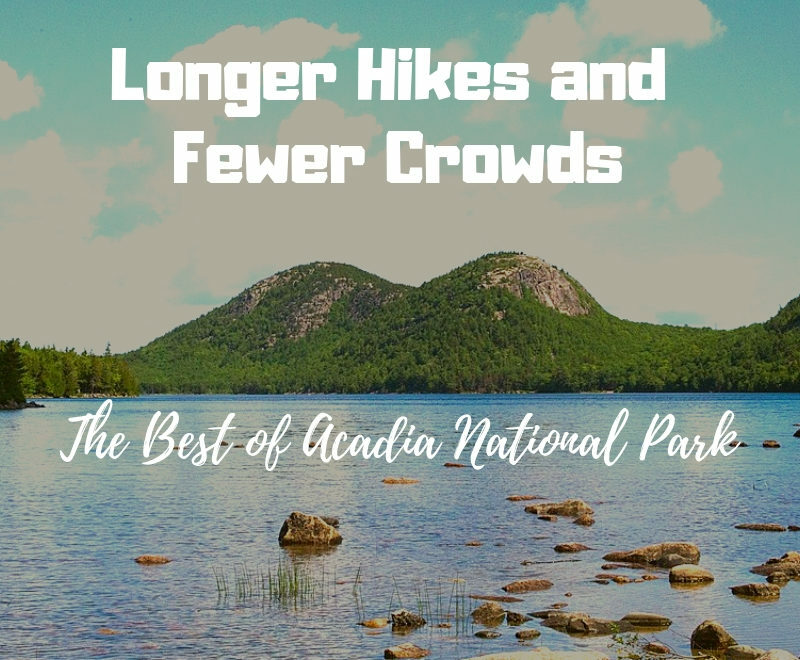 There are many wonderful guidebooks, maps, and websites that outline the numerous hikes in Acadia National Park and assist with planning your trip. The resources below are what I have found to be the most useful and accurate in my experience. Atlas Guide’s New England Hiker App (iOS and Android) – This is Guthook’s for the New England corridor. You can purchase all trails in Acadia for $7.99 in-app. If you have used his AT or PCT guide, you know how useful this is. Free route-planning software like PlotARoute or Suunto’s MovesCount – Create routes and download to your GPS watch or Google Maps. Acadia National Park Hardcopy Map – The trails can get confusing once you’re out there – a map like this is handy. A Walk in the Park – Well-written guidebook authored by a local with excellent trail descriptions. Acadia National Park Hiking Page – Maps and trail descriptions from the NPS website. Island Explorer Shuttle Bus Schedule – For planning trips and using the free shuttle. 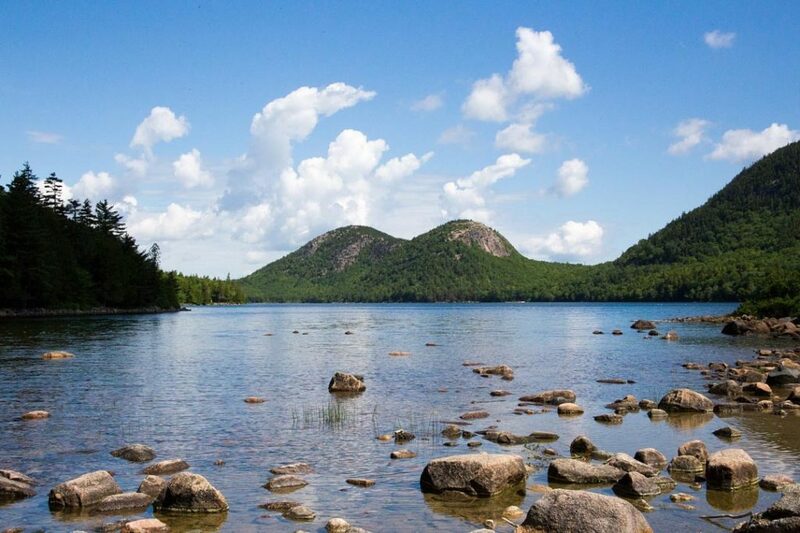 Joe’s Guide to Acadia National Park – Great Acadia photography and trail descriptions. All trails I have suggested here are part of Acadia National Park property, and even though you don’t actually cross a ranger station to get to them, a park pass is required. Also, camping is only allowed at the designated campgrounds and they are generally booked solid during the high season, so make reservations far in advance if necessary. 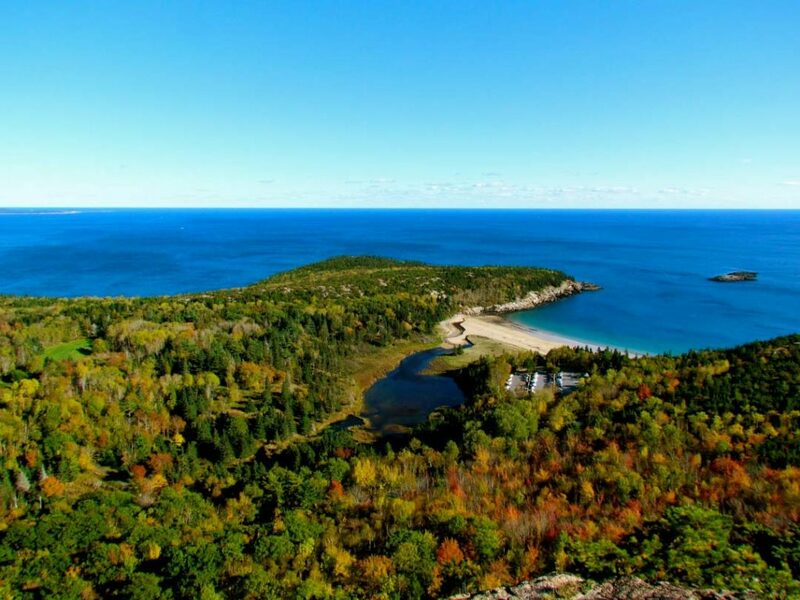 With over 150 miles of hiking trails, Acadia National Park is a true gem of the Northeast. At first glance, it appears that the spaghetti-like layout of footpaths is not conducive to longer treks. However, by optimizing your starting point to begin in an area with a high concentration of trails you can not only combine multiple routes to add distance but also avoid a majority of the congestion while you’re at it. If you’re a long-distance hiker looking to stretch your legs and soak in the Maine coast, look no further than Acadia National Park.